Is a National Park adventure filled with spectacular photography opportunities on your boomer travel list? If natural arches illuminated by sunrises and sunsets glowing over a vast landscape inspire you, Alan and I recommend a Canyonlands photography adventure in Moab, Utah. And, yes, it’s possible to make this a do-it-yourself-trip using our Canyonlands National Park photography tour tips. We’ll show you Canyonlands best photo spots on a two-day itinerary that’s sure to please, even for non-photographers. It’s one of our favorite Utah National Parks. You’ll be getting up early and staying out late on this busy Canyonlands photography itinerary. 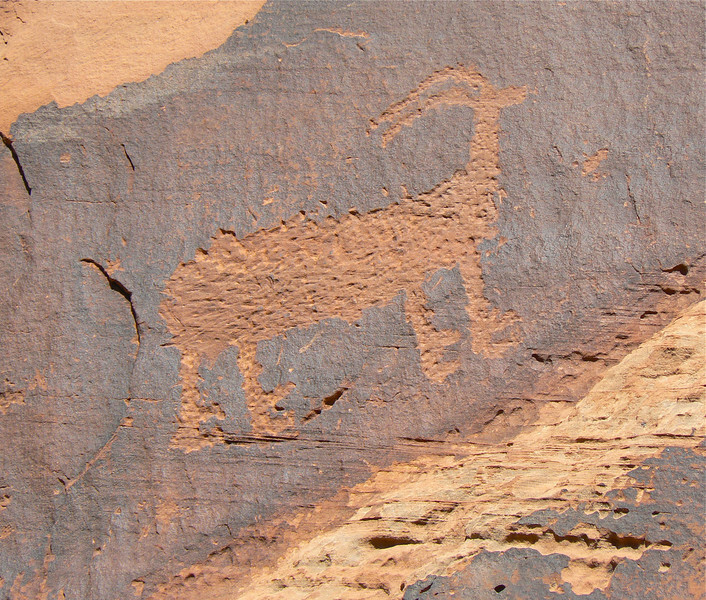 But these amazing sites near Moab, Utah, are worth it. And you can always catch up on sleep upon returning home. Not a photographer? 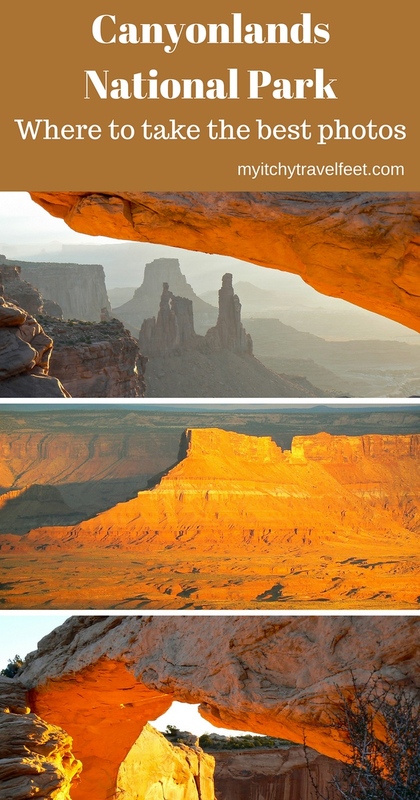 Try our two-day tour to experience Canyonlands best sunset and sunrise views rather than photographing them. You’ll be seeing the park from a photographer’s point of view. Sunlight illuminates a rock formation near Mesa Arch. After arriving in Moab, settle into your favorite lodging, then set the alarm for an early morning wake-up (at least an hour-and-a-half before sunrise) for the beginning of your Canyonlands National Park photography experience. It’s about a 40-minute drive to the Islands in the Sky district of Canyonlands and you want to arrive before any hint of daylight. Getting there: Take U.S. Highway 101 north of Moab for ten miles, then turn left on Utah highway 313 for the 22-mile drive to the park entrance. You’re headed for the parking lot at Mesa Arch, where, just down the trail, many a sunrise has been captured—both famous and not so famous. You won’t be the only one photographing a Mesa Arch sunrise. 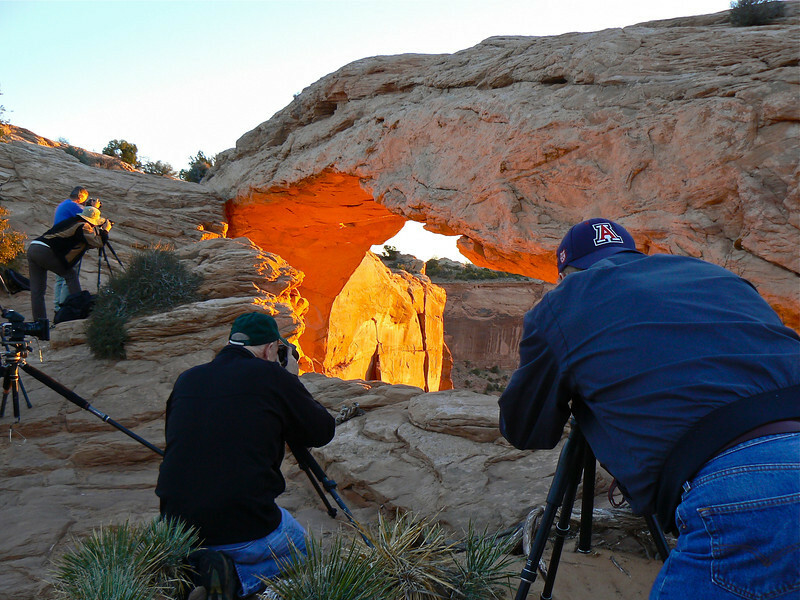 Have you seen our Mesa Arch sunrise photo tips? Bring a flashlight because it will be a dark walk over the short, unpaved trail. I hope you packed a thermos of coffee. You’ll be here for at least two hours. Before returning to Moab for a very late breakfast, continue on the Islands of the Sky Road to the Green River Overlook. The sunrise may be complete but you’ll still find plenty of creative photography ideas. Much of the morning’s good light will have turned to the glaring sun of a high desert day. Spend some time walking the path along the edge of the sandstone cliff that overlooks the buttes and mesas of a vast landscape for a humbling boomer travel experience. Retracing your drive, just before reaching Moab, take a short detour west on Utah Scenic Byway 279. I know you’re hungry but this experience is worth it. After about five miles, pull over on the cliff side of the road (be careful of highway traffic). Look up. Do you see the petroglyphs located about 25 to 30 feet up the wall? They’re from the Formative Period—the time of the Anasazi and Freemont peoples. 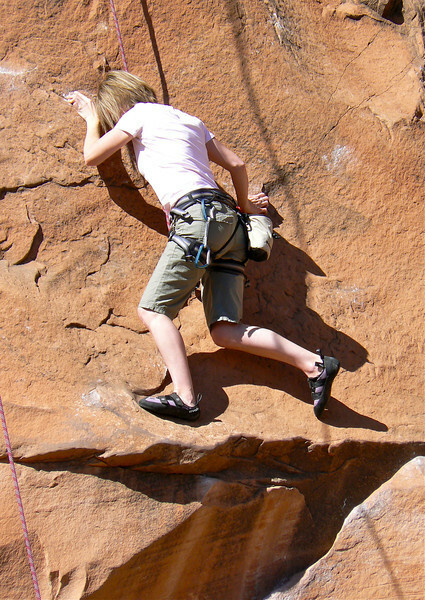 You might see a rock climber practicing her skills. And what’s that figure on the wall a few feet back up the road? Oh, that’s a rock climber, they make good photo opps too. A peaceful Colorado River scene. 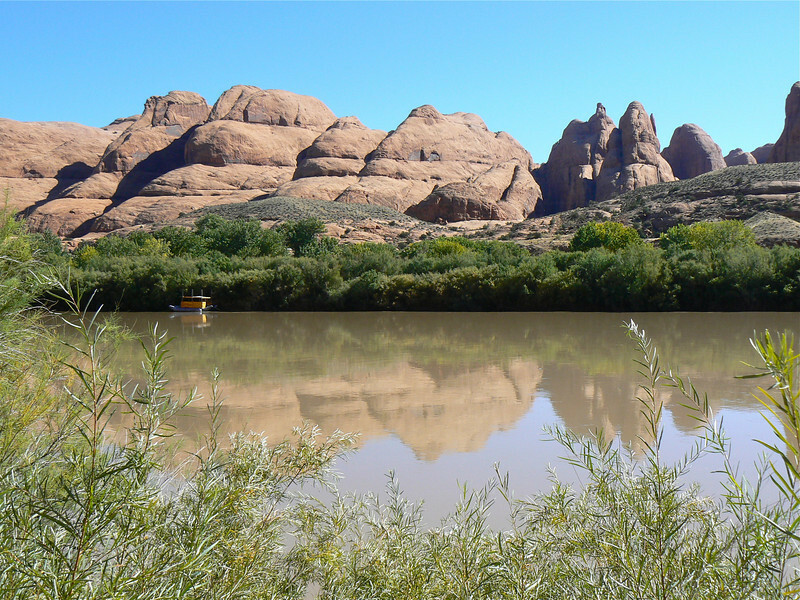 Before driving away, stop to admire the red rock landscape reflection in the Colorado River. Don’t be fooled, by the peaceful looking water, there’s whitewater rafting a few miles away. On your next visit, don’t forget to include a rafting trip or another outdoor adventure. Look at how many there are to choose from! After satisfying your raving hunger, and a well-deserved rest, drive to the Needles district to enjoy a Canyolands sunset photo shoot (75 miles total). You’ll be driving south on U.S. Highway 101. Build in enough time to stop at Wilson Arch (24 miles south of Moab). 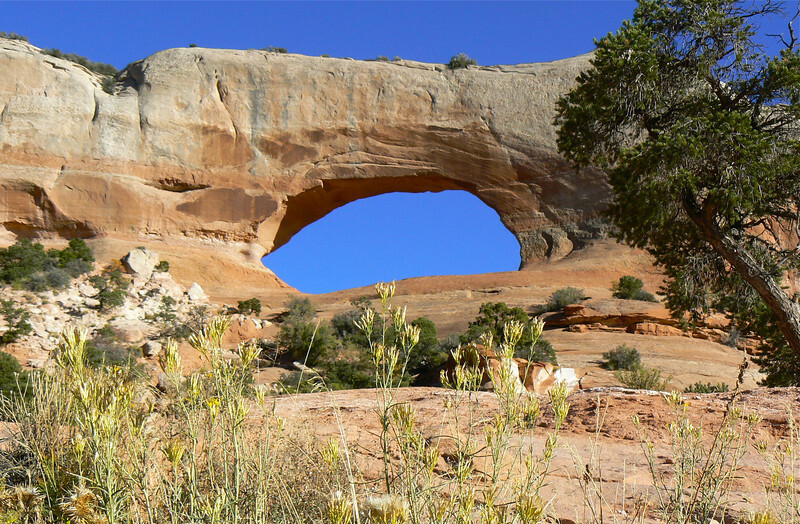 The entrada sandstone arch spans 91 feet and is 46 feet high. Wilson Arch is worth a stop. Don’t spend too long at Wilson Arch, you still have miles to go before the sunset. I hope you watched your mileage because around 40 miles south of Moab, you’ll be turning west onto Utah Highway 211 for the 35-mile drive to the Needles Overlook. Needles Overlook on an afternoon when the sunset wouldn’t cooperate. We didn’t have enough clouds! From the fenced edge, you’ll view mesa and canyons on land that once comprised a ranch larger than the state of Rhode Island. Remember to stay until dark because the best sunset photos come at the end of the sunset (as long as you brought along a tripod for stability). After retracing your steps back to Moab, there’s just enough time for a a beer and burger before hitting the sack. Did you sleep in today? This photographer’s schedule is hard work, but who wants to waste hours sleeping when there’s more to be explored? A different perspective on Delicate Arch from the usual photos of this famous Arches landmark. I recommend spending your morning at Arches National Park to visit a few of the 2,000 sandstone arches. 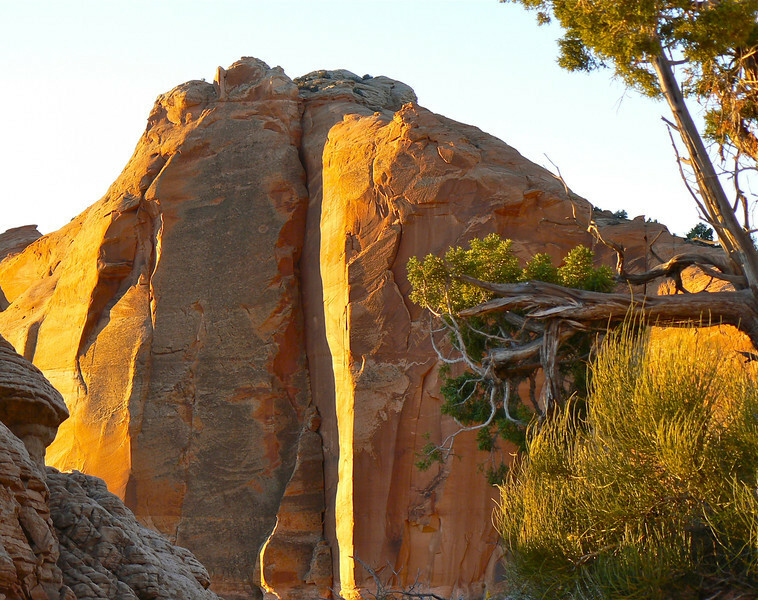 While you’re there, hike to Landscape Arch—a moderate two-mile walk from the Devils Garden trailhead. 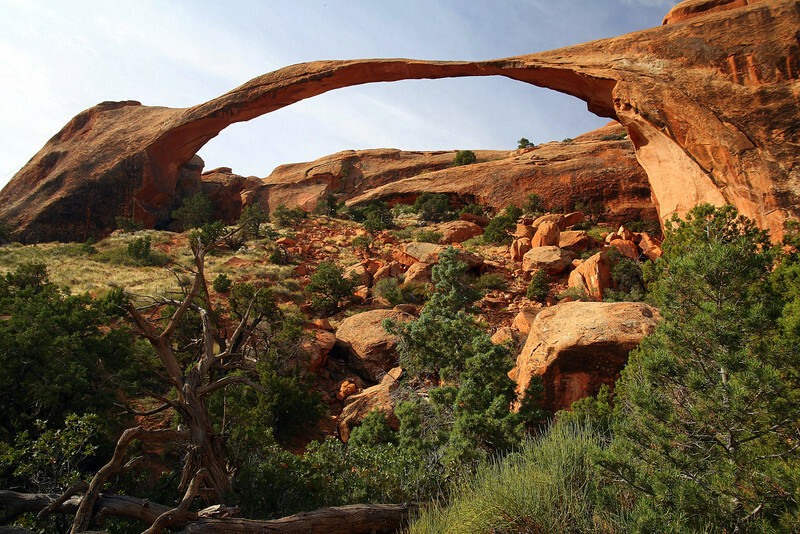 Take the time for the moderate hike to Landscape Arch. Later in the afternoon, drive back to Islands in the Sky. This time, stop at one of the overlooks you missed on Day 1 when you rushed to watch the sunrise at Mesa Arch. At the overlook peek through the pines to the valley below. Do you see the marks of a dirt road trail stretching through the wilderness? Next time, bring your 4-wheel-drive vehicle for a real adventure. The view through the trees from Islands in the Sky. We want to drive that road! 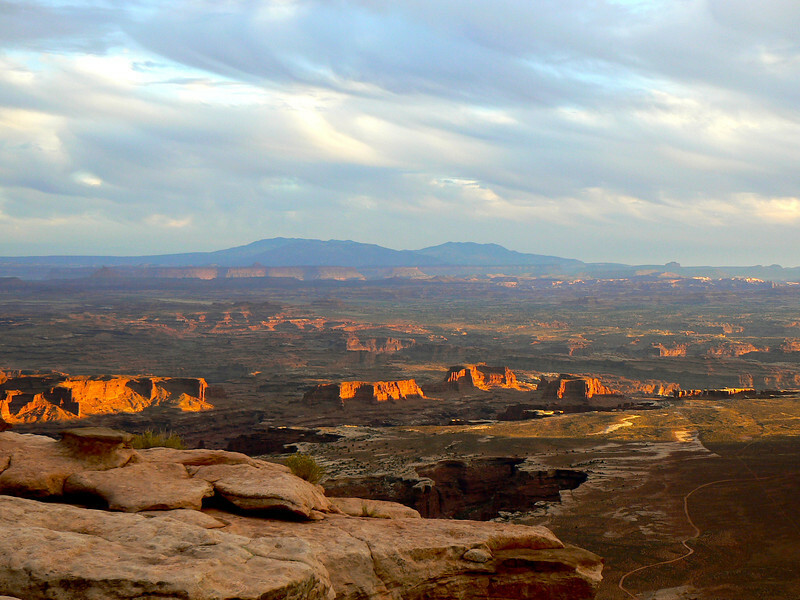 Don’t dawdle too long at the overlook, you still have a Canyonlands sunset to watch. Continue driving to the end of the Islands in the Sky Road and Grand View Point Overlook. Sunset at Islands in the Sky on a cloudy evening. Walk the trail that travels along the edge of the cliff to scope out your sunset watching spot. If the weather and clouds cooperate, you’re in for a fiery sunset show. 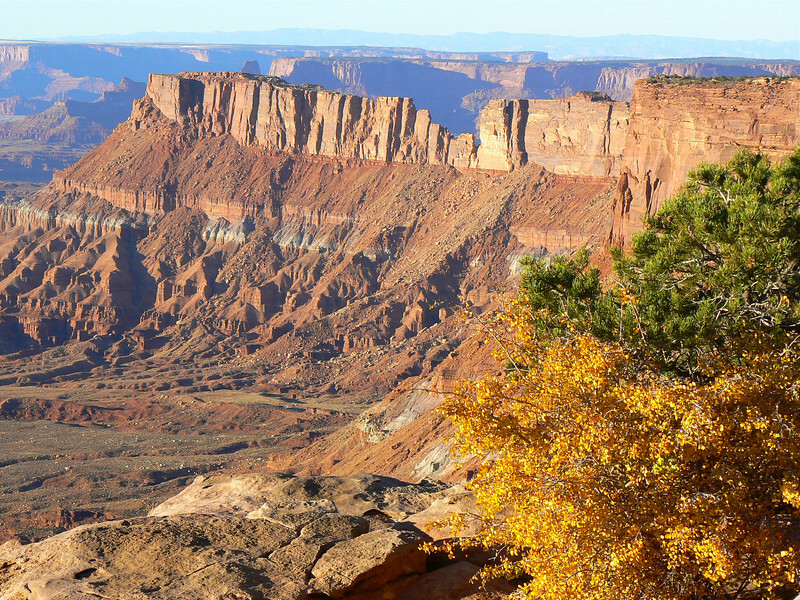 When is the best time to visit Canyonlands National Park? 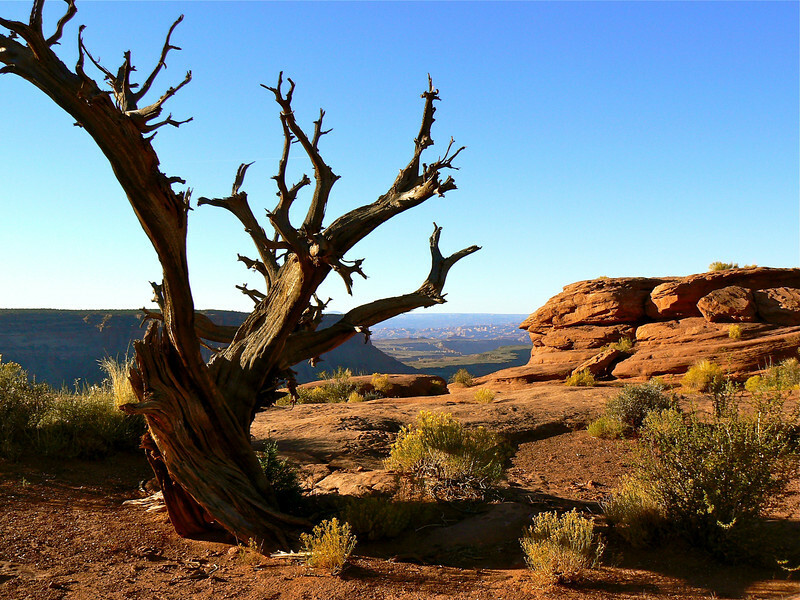 We prefer to visit Canyonlands in the spring or fall to avoid the summer’s heat and crowds. However, these days, national parks are so popular that you won’t be alone, no matter the time of year that you choose. And don’t rule out a winter trip to Canyonlands. Photographing Canyonlands in the winter can be spectacular if there’s snow on the ground. 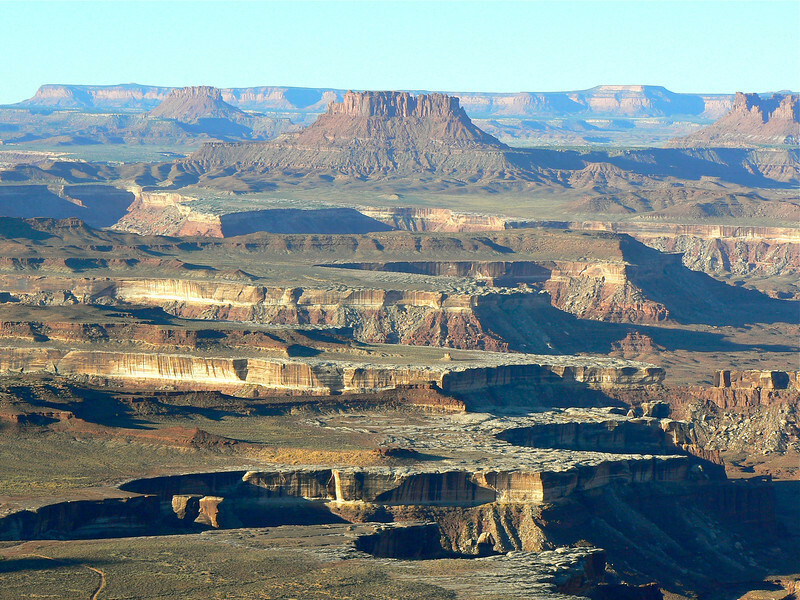 Where to stay in Canyonlands National Park? If photography is your goal, there are plenty of medium range hotels in Moab. You won’t need much else because you’ll be up early taking sunrises, staying out late for the sunsets, and catching a little sleep in the middle of the day. But if you’re looking for a luxury travel experience, consider Sorrel River Ranch Resort. 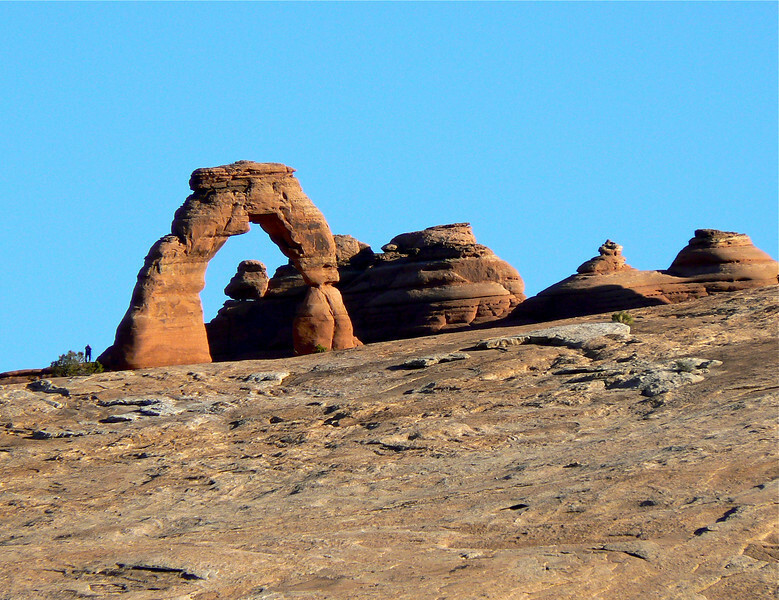 Enjoy Arches National Park, especially the hikes. 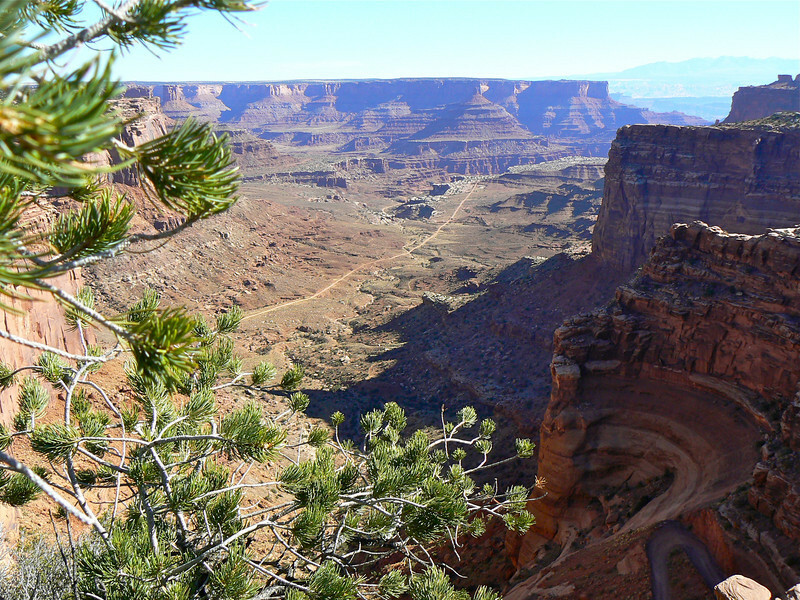 Explore Dead Horse Point State Park and the awesome views. Drive the Poison Spider trail. Alan owes me an article on this one as I was too chicken to go with him. Check out the websites, tips and products listed on our Utah Travel Resources page for planning your next trip to the Moab area.